One question we are often asked is Hows my horses weight? While body weight is an important individual characteristic, what is more important is body condition score or BCS. BCS uses both how your horse looks and how it feels to the touch to evaluate the amount of body fat it has. BCS is scaled from 1 to 9, with 1 being emaciated with no fat, and 9 being grossly obese. The ideal body condition score for a horse is around 5-7 depending life stage. For instance, the average pleasure or show horse should be about a BCS 5  the ribs should be easy to feel but not visible, the shoulders and neck should blend smoothly into the body and the back should be flat, with no crease. A pregnant mare, however, should be maintained between a BCS 6-7. She should have some fat over her ribs, withers and tail head; she should also have a slight crease down her back and some fat over the crest of her neck. By maintaining this BCS throughout the pregnancy, the mare will have the extra energy reserves needed to stay warm through the winter, grow her foal, and after birth, feed the foal. Whatever the goal, the key is to try and maintain the desired BCS. Some horses can eat the same amount of feed year round and maintain their BCS, but other horses may fluctuate throughout the seasons and may need an increase or decrease in feed to maintain a BCS. 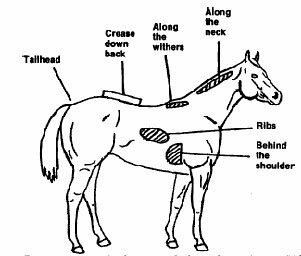 So, really touch your horse often and try and assess BCS. If the bones in the area in question become more prominent, or on the other hand, difficult to identify, you may need to gradually adjust your horses diet accordingly. If your horse has a very high or very low BCS despite appropriate diet changes, consult you veterinarian, as a medical or dental problem may be contributing to abnormal BCS. If you have questions about how to assess BCS or about diet changes, feel free to ask!